Jack the Dripper strikes again in Convergence, one of Jackson Pollock’s most famous drip paintings. With regards to his style, Pollock once said: “It seems to me that the modern painter cannot express his age, the airplane, the atom bomb, the radio, in the old forms of the Renaissance or any other past culture. Each age finds its own technique.” To find his technique, Pollock ditched the traditional easel and brush, and instead put large canvases on his studio floor that he would hover over as he dripped, poured, and splattered paint onto them. But despite the splash that Pollock made in the art world (pun very much intended) with his unique style, he was ready to move onto something new by the 1950s. So, Convergence originally started as an experiment in black and white. But Pollock took one look at the colorless canvas, thought hell naw, and started adding hues on top in an attempt to salvage the painting. At the time, critics weren’t entirely sure if he was in fact successful in salvaging it. So savage. But what did they know back in 1952 anyway. 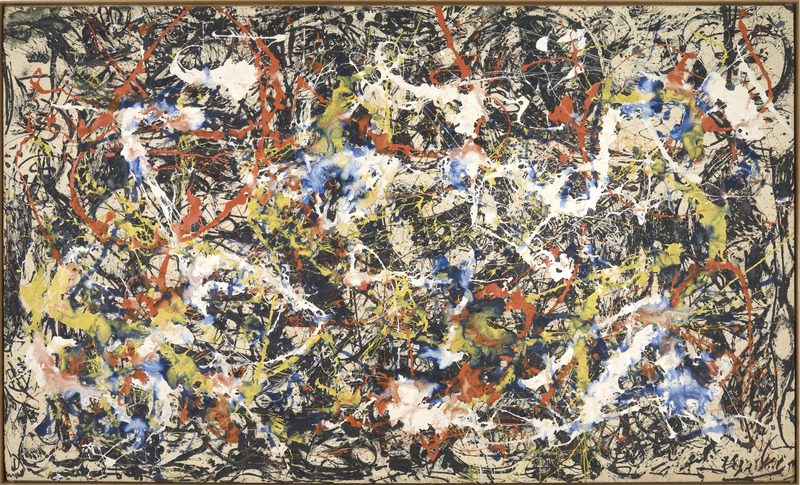 The painting is now considered one of Pollock’s masterpieces. Like most masterpieces, Convergence has infiltrated pop culture. In 1964, puzzle maker Springbok released a jigsaw version of the painting, billing it at the time as “the hardest jigsaw puzzle in the world,” as people across the nation tried their hand at completing the masterpiece. Though back then the puzzle contained only 340 pieces. C’mon people! Not to worry, a 1,000-piece version (now that’s a real challenge) has since been released. If puzzles aren’t your thing, fear not, Convergence stamps also exist, released as part of a 2010 US Postal Service series that featured art by abstract expressionists. The stamps were all different sizes as if they were hanging in an actual gallery. Pretty nifty! Another signature of Pollock’s paintings is that he would often integrate everyday objects, such as nails and coins, into the canvas. In Convergence, a small match covered in paint hides near the center. My pathetic eyes have not been able to locate said match on the computer screen, but perhaps you’ll have more luck. Or perhaps we should all just fly to Buffalo, New York to see the painting in person at the Albright-Knox Art Gallery where it has hung since 1956. Of course if that’s not possible, there’s always the puzzle. Convergence is a 1952 oil painting by Jackson Pollock. The composition was painted on canvas. Convergence is one of the paintings by American artist Jackson Pollock, who is known as a representative of abstract expressionism. The composition was created on a canvas, measuring 93.5 inches by 155 inches. It is an oil painting, which constitutes wide range of colors, lines and shapes, made by method of dripping and pouring paint onto canvas. These lines, spots, circles splattered on a canvas unintentionally convey the artist's emotions. The painting was made during the Cold War with Russia, and it is considered that the painting represents the idea of freedom of speech. Check out the full Wikipedia article about Convergence (Pollock).